So what is Rebecca doing this week? She is having WAY too much fun with the glue, florist foam and needle and thread is what. I decided to do a little pictorial tutorial ( Hey!! it rhymes!) on the daffodils and tulips I did for the previous photo shoot. I found the little clay pots at my favorite garden store but I think you can get them at Michaels or JoAnne’s as well. Tangential thought…are all craft stores someone’s name?…Michael, JoAnne, Ben Franklin…Anyone know? Anywhooo…onward… Take your pot, fill it with something to hold the flowers. I use florist wet oasis/ foam because it is easy to cut and it molds to any shape. 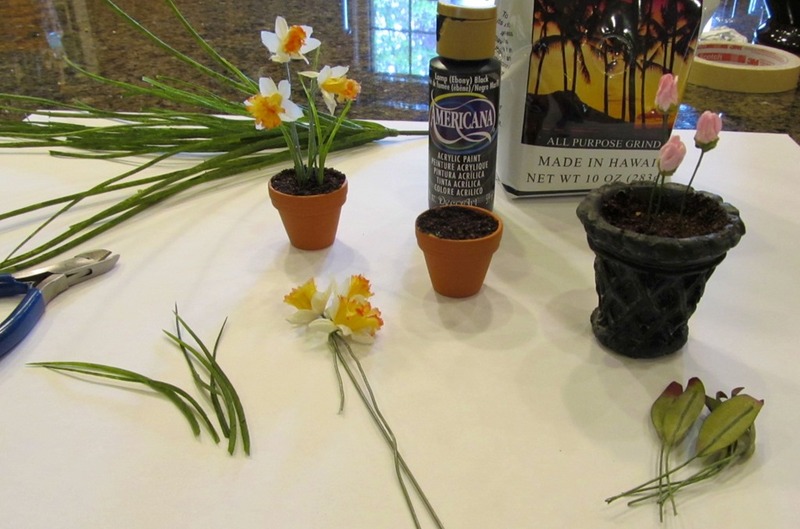 I usually have it on hand to do floral arrangements but you can use whatever you have on hand. Many people use clay as well. I cover the foam with black paint and while the paint is still wet, I sprinkle coffee grounds on the foam allow it to adhere then shake off excess. Yes, this floral arrangement will smell like coffee for a while. You can use loose packed tea as well for a different look and smell. You may need to send the tea leaves through a sifter to get them to a small enough scale. 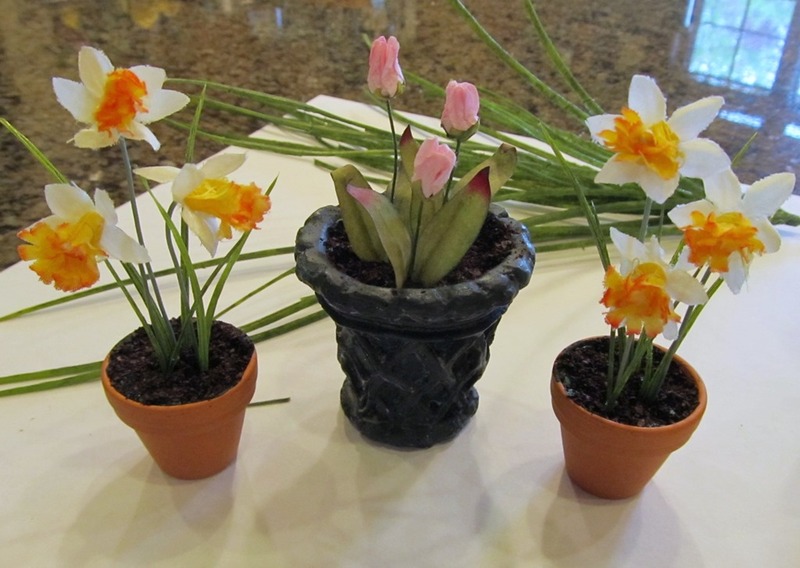 I cut pieces off of a random piece of greenery I had purchased at a craft store for the daffodils. For the tulips, I used leaves I had purchased at a craft store ( usually in the wedding section with boutonniere supplies). The pink paper tulips were sent to me by a friend from Holland ( love ya!) and the daffodils are another story. They are fabric flowers and not paper. I found them in a bundle at Ben Franklins(yet another craft store named after a person) about a year ago. Originally, the orange part was a full flower. I decided to sew the flower closed to get a trumpet and voila!…daffodil. I think it was just plain luck that it was in the right scale. I am currently in LOVE with an Etsy shop called miniCHAIR ( http://www.etsy.com/shop/miniCHAIR?ref=top_trail). I purchased a shabby chic table with two chairs a week ago and loved it so much I had to get the hutch to go with it. The prices are reasonable ,in my opinion, for the 1/6 scale market. They ship super fast and pack things well. I have also been busy with more paper minis. 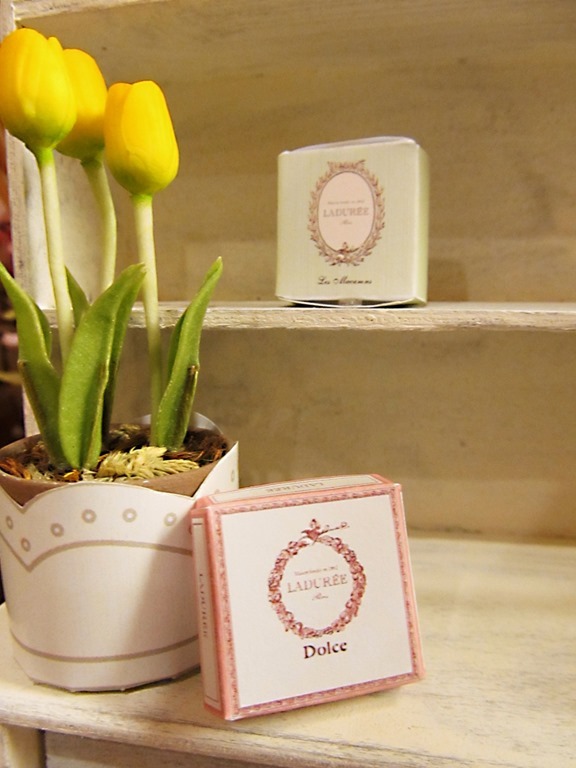 LOVE the Laduree boxes. This entry was posted on May 1, 2013 by raberry65. 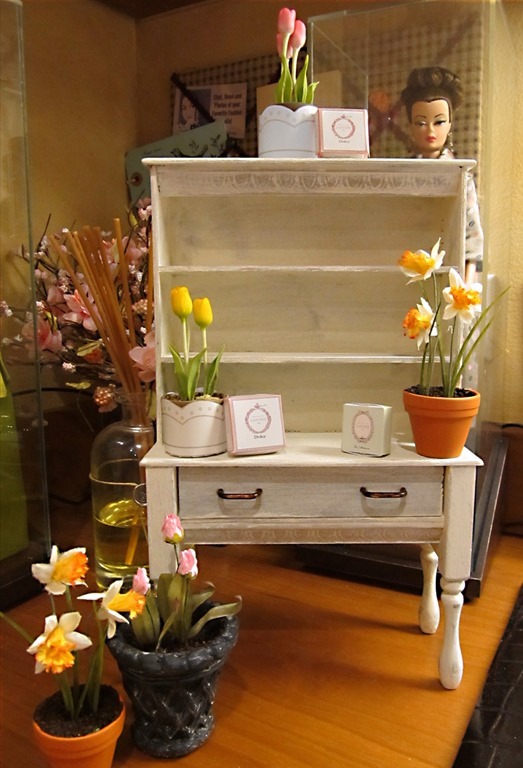 It was filed under Doll Diorama, How to and was tagged with 1/6 diorama, 1/6 scale floral arangments, 1/6 scale furniture, diorama building, Doll Diorama. Arrgh. Don’t tempt me with making diorama items! LOL these are adorable though! Oh come on…like you don’t tempt me all the time on your blog 🙂 Glad you liked these. Thanks for showing how to make these and also for the link on that great Etsy shop. I can think of one arts and crafts store not named for a person–my favorite Hobby Lobby!! But, can’t think of any others that don’t have a person’s name. Also, AC Moore is another to add to list of those with a person’s name. Oh yea..Hobby Lobby is a big one too. One just opened close to us. I need to go! I am not familiar with AC Moore. Will add it to my list 🙂 Thank you for the info Barbara and I am glad you enjoyed the links. What a great idea of using coffee and tea ! And love your Laduree boxes !!! This looks great, your daffodils are beautiful! I’m bookmarking that Etsy shop, they have cute stuff. Thank you Renatta! I adore the Minichair Etsy shop. Too many adorable things there to mention. 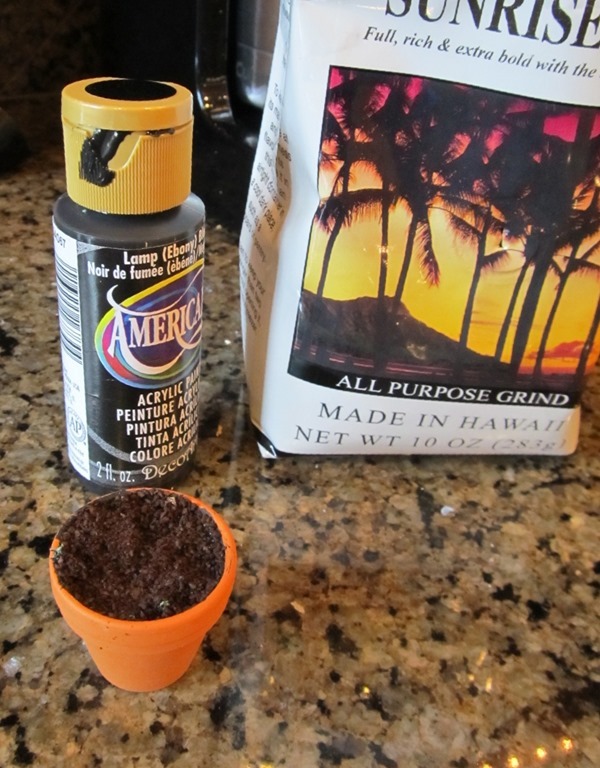 These are adorable and great idea about coffee grounds as dirt. Thanks for all the great tips!!!!!!!!!!!! You are very welcome Peter!